HolidayExtras.com® offers cheap Belfast City airport hotels at discounted prices  you can save as much as 40 per cent by booking in advance with us. We're the UK market leader for travel add-ons and we work closely with our suppliers to offer you the lowest possible prices. We even protect all of our prices with a Best Price Guarantee, so you can book with confidence that youre getting the best deal around. Why is it a good idea to book in advance with HolidayExtras.com? Booking in advance online with us could save you up to 40 per cent on the standard hotel price. By pre-booking as early as possible, youll guarantee yourself the room of your choice at a brilliant price. As room availability decreases, prices usually rise, so make sure you dont get caught out at the last minute. We also offer exclusive deals online, such as the chance to pair your room with a great value parking package. Which cheap hotels are available at Belfast City airport? 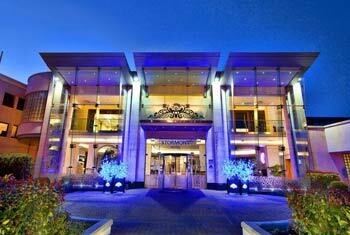 The gorgeous 4-star Stormont Hotel is our Belfast City airport hotel, and you won't forget it in a hurry. This sophisticated and modern hotel is just 3.5 miles from the Belfast City terminal and transfers take just ten minutes. All rooms are stylish and contemporary, with comfortable beds and luxurious furnishings. In your room youll be able to take advantage of the high-speed WiFi connection, hairdryer, 24-hour room service, television, telephone, radio, tea and coffee-making facilities, iron and trouser press. What upgrades can I add to my Belfast City hotel booking? 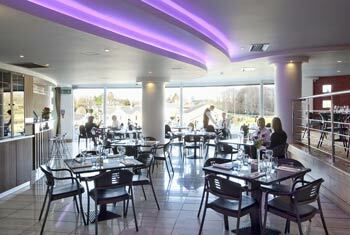 Enjoy a delicious three-course meal by reserving your table in the hotel's La Scala Bistro. Youll be able to head straight to your room for a good nights sleep before your flight without even leaving the hotel. You can also upgrade your room to an executive room for just £30 more. Indulge yourself with a king size bed, bathrobes and 32-inch flat screen TV and start your holiday relaxed and refreshed.